a) By Flight: If you want to go from Kathmandu you can take 1 hour flight to Bhadrapur or Biratnagar and then take about 6-7 hours bus ride to Sikkim or Darjeeling. If you want to go from India then the nearest airport is Bagdogra near Siliguri in West Bengal. It is connected by daily flights from New Delhi and 6 flights from Calcutta (excluding Thursdays) every week. 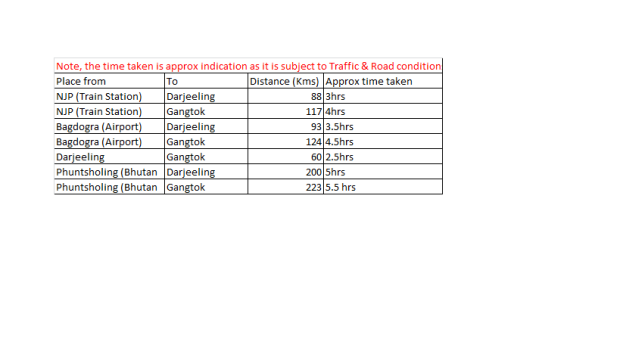 It is 115 kms from Gangtok and takes about 4 1/2 hrs. Recently a 4-seater helicopter service from Bagdogra to Gangtok has started and takes about 20min. c) By Overland trip: You can travel by bus to Kakarvitta from kathmandu and then hire smaller vehicles to Gangtok or Darjeeling. From Silguri there are more options with vehicles to Gangtok and Darjeeling which takes about 5 hours. If you are planning a visit Bhutan, you can combine the trip with extensions to Sikkim or vice versa.